Polaris Phoenix - Chinese Built Polaris ATV. Polaris Phoenix - Should You Buy This Chinese Built Polaris ATV? What? You didn't know the Polaris Phoenix was built in China? Well, technically it's built in Taiwan by AEON. I do make a distinction between Taiwan and Mainland China in this case. Most of the major Taiwan manufacturers actually do a pretty good job. And the Phoenix is built to Polaris specs. So let's take a look at this ATV. 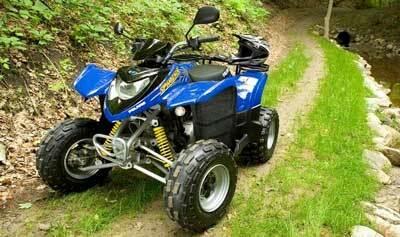 The Phoenix was introduced a few years ago as a full size entry level ATV at an affordable price. Aimed at beginning adult riders, it worked well for young riders looking to move up to a full size machine as well. The Phoenix 200 comes in blue for 2013. Which brings me to a misunderstood feature of the Polaris Phoenix. The inner and outer mounting points for the front shock and spring units. I've heard riders rail about the "stiff shocks" - and then other riders moan about the "soft shocks". The deal is that the alternate mountings were provided to accommodate a wide variety of rider weights and skill levels. Inner mount for lighter weight and/or slower riders - outer mount for heavier and/or faster riders. Hope that clears it up. Polaris sells this street legal Phoenix in the UK. Engine - 196cc air-cooled four stroke with a carburettor. Makes OK power in a docile, non-intimidating kind of way. Electric starting with a kickstart backup. Good for beginners. Driveline - Simple CVT transmission with forward, neutral , and reverse. Low maintenance shaft drive on a solid rear axle. Simple, tough, and durable. Not great for higher speeds or really rough terrain. Suspension - Dual A-arm front with the optional inner and outer mountings. Single shock rear swingarm. Nothing fancy but it all works. Spend a little time getting the front end adjusted to your weight and riding style and it works surprisingly well. Brakes - Hydraulic discs up front and a sealed drum out back. Hand lever operated with a separate foot lever for the rear. Pretty minimalist, but on an entry level ATV you have to cut cost somewhere. Extras - Skid plates under the engine and swingarm. Optional pink power color for the girly girls. Racks and hitches are also available as options. 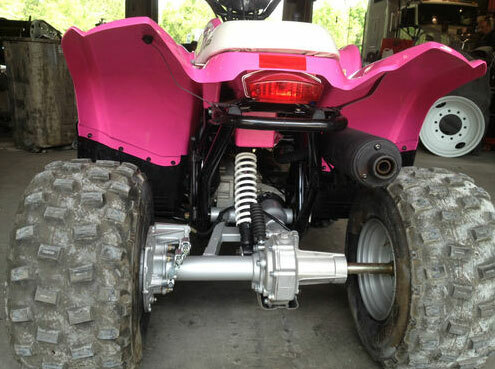 No more pink for 2013, but the single shock rear suspension still has 6.5" of travel. Does the Polaris Phoenix Work? 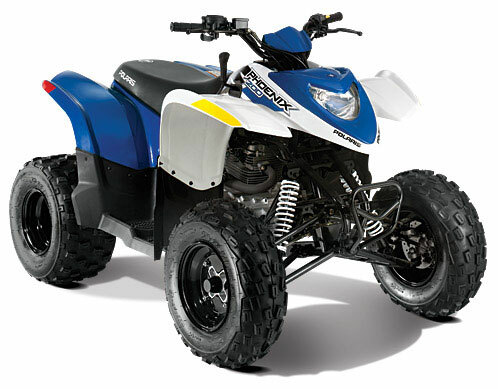 If you're looking for a first ATV and want to keep things simple, this Polaris will do the job. The entry level price of a suggested $3,299 let's you try four wheelers without breaking the bank. Maintenance is simple enough you don't have to be a certified mechanic and that will save a few bucks too. For a young rider over 16 wanting to move up to a full size quad, it works. The adjustable suspension will give them some room to grow as they get heavier and want to go faster. The mild engine should keep them out of too much trouble. The simple, tough design means durability is good enough to keep you on the trail instead of in the shop. As always, we recommend you test drive one yourself and decide if it's right for you. Noisy transmission - caused by the dampener on the driven clutch. Not a problem so much as an irritation. Lack of power and rough running - caused by incorrect jetting of the carb. This should normally be handled by the dealer. Jetting should be adjusted to your riding area by the dealer. It's not that big a deal though, usually moving the clip on the needle in the carb one position higher or lower will fix it. Funky kickstarter - most owners weren't big fans of the do-it-yourself lever or the positioning of it. Just keep your battery charged for the electric start. Other than those few things, surveys show that most owners were happy with the Polaris Phoenix and reported few major problems. They've been out long enough to have the bugs worked out, so for the money it looks like a pretty solid deal.